Maestro and I took a little sojourn yesterday. 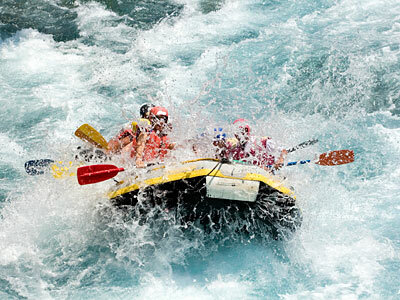 White water rafting through some tumultuous “rapids”. It was another of our spontaneous trips. No planning or notice. No time to pack. No need for anything. We never even left the bed. As M entered my raft, it was obvious that he was to be my guide for the evening. He was adept at navigating the rough waters ahead. He was in total control. He led me into the river, maneuvering towards the first set of rapids. The wetness was all around and I could tell the waves were increasing in intensity. I decided to assist my guide by grabbing his oar and paddling toward the first part of our expedition. He was appreciative of my attention to detail, showing me how best to steer. The waves lapped over the raft again and again. The intensity continued to build and his skilled maneuvers took me straight into another set of rapids. These were even more intense and I found myself soaked. The rush was incredible and he could see that I was ready for more. He navigated the raft with sharp expertise, changing direction to yet another set of rapids. These were so fierce…so consuming that we both ended up drenched. We never capsized. M kept the raft afloat and each set of rapids proved more powerful than the ones before. I was eager to go farther each time. I wanted more, and the way he maneuvered the raft in perfect direction, gave me the ride of my life. At the end of our lengthy expedition I was parched and only he could quench my thirst. After drinking my fill, he guided me out of the river and we basked on the shore…both of us spent and energized at the same time. Quietly lying there, recollecting the journey we had taken. As I adjusted my pillow and rolled over to spoon into his form, I smiled to myself. Wonder where our next trip will be? Posted on June 12, 2015 by Lex Jones	This entry was posted in MAESTRO, She, Uncategorized and tagged Control, journey, lifestyle, Master. Bookmark the permalink. Oh dang, now you’re making me really jealous. SK has never mastered the dive… sigh. i loved this post, Lex! i loved the analogy! Lucky girl, my friend.